All you have to do is point anywhere on the baby’s head to learn the parts of the face. Stella had a difficult time with this, though, because she tended to “paw” at the image, which kept making the “BUZZ” sound (invalid selection). I’ve noticed that she does this motion with certain apps, but not with others. I can’t figure out the variable. For example, when using the Color Dots app, she pointed with her index finger more frequently than she pawed. Perhaps low detail and high contrast are factors? Maybe there isn’t a pattern at all. 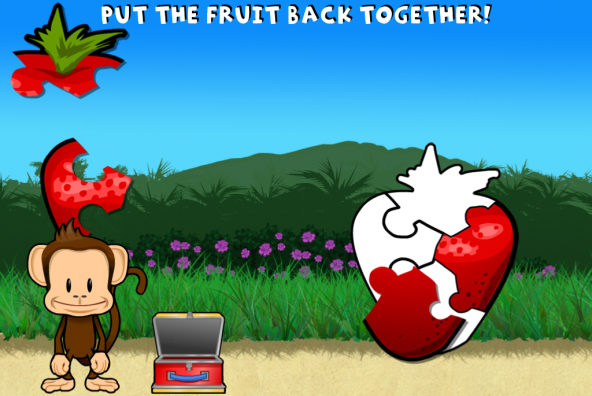 Lately when using the Monkey Preschool Lunchbox app (a game with high detail and high contrast), she paws when matching cards, but uses her index finger to drag-and-drop puzzle pieces to the correct location. I have yet to catch the puzzle part on video, which is probably for the best because I squeal in the highest pitch known to man every time she does it. But you can get the idea of the motion required from the screen shot of the strawberry. 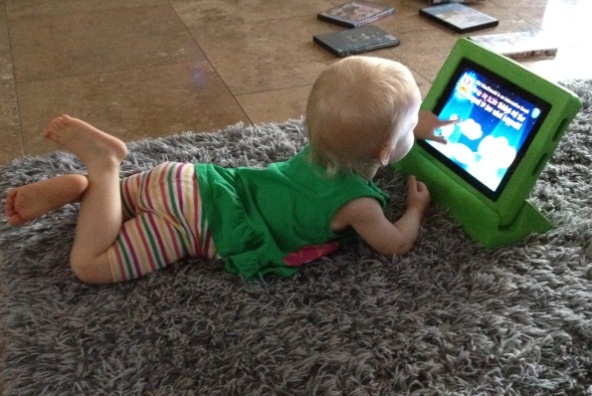 Either way, Stella loves learning and loves the iPad 2! Netflix: We are able to stream Neflix through our Blue-ray Player or XBox (wow, are we spoiled), but there is something especially enchanting about resuming content in our queue at the exact spot where we left it. Videos: I feel like I got a 2-for-1 on my Yo Gabba Gabba downloads. And, no more storing DVDs! FaceTime: Grandpa is finally life-size! Web Browsing: Browsing the web as a family affair? Hello, Google DNS and parental controls. And for those of you who are concerned about the amount of her daily screen time (more on this later), she also played with non-digital toys—and boys!—all day long.